Fertilize in the spring after blooming with a fertilizer for acid-loving plants. The blueberry is prized for its sweet to tart edible fruits. 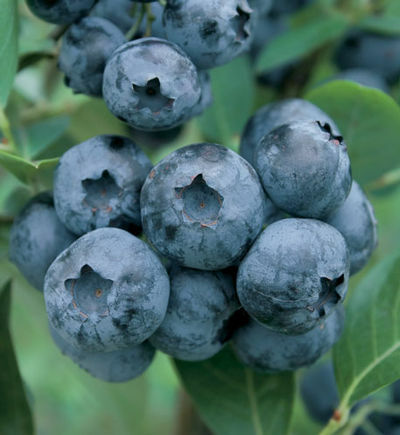 Referred to as a “super fruit” the blueberry provides a source of amazing health benefits. The perfect snack, blueberries are packed with vitamins A, C, iron, potassium, phosphorus and just 80 calories with 4 grams of fiber per cup. Early to mid-spring bell-shaped creamy white flower give way to frosty, sky blue berries that start to ripen in June, July and August with the later blooming varieties lasting into September. They will fruit on their own each year but planting a different variety with the same bloom time will greatly enhance berry production. Grows well when planted in highly acidic, well drained but moist soils. Does well in sun or partial shade and can be grown in a container on small patio and balconies. The blueberry is a deciduous plant that has year round interest. Winter stems can be a bright red, orange or yellow. We grow the Northern High bush varieties.